Set up an appointment to talk about your skin or body concerns. Let's talk about your needs! Fee is waived with purchase of $50 or more. Please also check the box for the 60 min massage service in addition to this box. Using Stem Cell Extracts and 24K nano Gold, this luxurious facial will make you look and feel like a celebrity! Hydrates, firms, plumps and rejuvenates the skin, leaving it brighter and more youthfully glowing. The results improve even days afterwards. Nano technology device creates increased permeability in the skin without puncturing, allowing for optimal penetration of a specialized cocktail of potent anti-aging ingredients. Featuring Nano-gold, antioxidants, stem cell extracts, peptides, brighteners and hyaluronic acid for a marked reduction in the appearance of fine lines and wrinkles, smoother, plumper, more hydrated and youthful looking skin. Results continue to improve over days! Ginger, vanilla and cloves create an aromatic facial which will relax both the body and the senses. Prepare for a warming sensation with these spices, and also the expectation of pore refinement and soft/exfoliated skin. Blended in are 2% salicylic to refine pores and 2% mandelic for skin brightening. All combine to create the perfect anti-aging, antioxidant facial. Available while supplies last. BOOK NOW! 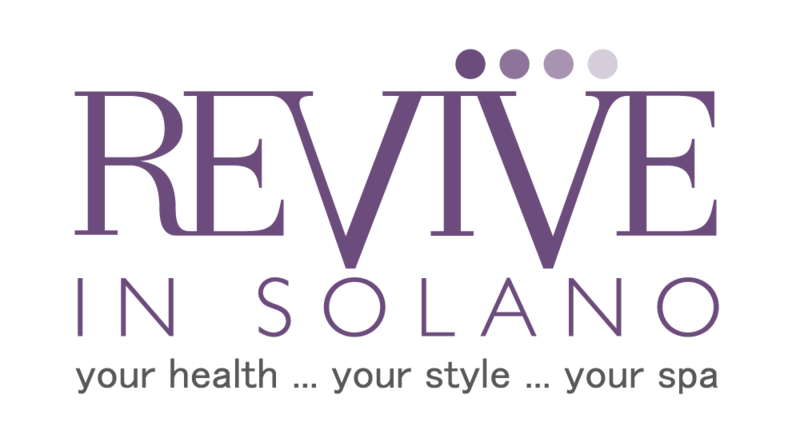 Indulge yourself or someone you love in a Spa Getaway at REVIVE in Solano! Our Signature Facial/Massage Combo + a Full Body Scrub, Hand & Foot Treatment, and Neck & Decollete Target Treatment. Give your feet a royal treat! Begin with a detoxifying foot soak and an exfoliating scrub. Then luxuriate in a hydrating and softening foot mask while your hands receive an ant-aging treatment. Finish with a relaxing foot reflexology massage. 60 minutes of Bliss! Let us help you design your look for everyday, special occasion or a wedding. One hour appointment includes color matching, application and tips for how to create your new look yourself. Consultation fee may be applied towards makeup purchase made at the time of your appointment. Consultation fee is applied towards makeup purchase that day if you choose to purchase products. FDA Cleared as safe and effective for treating Arthritis, Muscle Spasm, Muscle & Joint Pain, Joint & Muscle Stiffness, Muscle Tissue Tension and Diminished Local Circulation.